First of all, thank you so much for the outpouring of love, support, and encouragement from yesterday's gloomy faith-questioning post. I was at a very low place yesterday. I couldn't stop crying for the majority of the day. I cried while in the shower, getting ready for work, driving to work. I was so upset I think I even forgot to brush my teeth. I had a one-on-one meeting with my boss and he asked me how I was doing with everything because he knows the basics of what is going on. And guess what? I cried in there too. At least it wasn't sobbing ugly-crying. Just more of the eyes-tear-up-and-you-need-to-catch-your-breath-before-speaking kind of cry. He is very understanding and said if I need time away from work, I can have it. I'm sure I will, but right now I'm trying to tough it out because I will need it if the end finally comes. One of my coworkers came over to me later in the day and asked me if I was okay. I think he could probably sense my moping and lack of talking to others. I explained things weren't going well on the pregnancy front, and of course choked back tears explaining it. Hopefully the crying trigger will be a little less sensitive today. The OB's nurse called yesterday and left a voicemail. She said they received the beta results. If you'll remember, the OB said at Wednesday's appointment that if the beta was below 10,000 he would call this over now. Well, apparently he saw the results were 8661 and is now saying that we should still "press forward" so I would consider that a change of mind from his earlier statement. I'm slightly uplifted by this, except I still believe this is not headed in a good direction. But at least I know his recommendation is not to end this now. Because I couldn't even if he wanted me to. My next ultrasound is next Wednesday, March 27th at 8:30am CST. Thanks for your comment...I'm so terribly sorry you are going though this. I really hope (and pray) that somehow this will still turn out okay. Thank you so much. I'm trying to make myself hang onto more hope too. I am so sorry you are going through this. I shared your previuos post with my DH, it touched his heart and he felt your pain. I hope that you can find some peace in the days ahead! Aww, I am touched that you shared it with YH. Thank you so much for the kind words and well wishes. Prayers! I can't imagine what you're going through... I'm so sorry that you're going through this! What a wild ride! Hang on! You must have a little fighter in there and I'm glad your doctor is fighting for your baby too!! I am so grateful for this doctor! I can't imagine going through this with those crazy nurses at my RE. 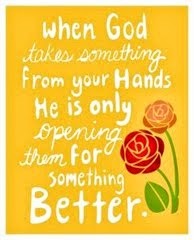 Everything happens for a reason and I'm glad I had a fast forward to the OB so quickly. I trust him completely! Thank you for the kind words. I'm so glad your work is being supportive. Sending more hugs and positive vibes! Me too, I am very blessed in that regard. I appreciate the hugs and positive vibes! It's so hard to be in limbo, but I'm glad your doctor isn't forcing you to make decisions you don't want to make. Me too, he's being phenomenal and incredibly caring. This means so much!!! Thank you for the prayers, love and hugs! I was returning your visit and came across this post. I went back and read the others and I'm so sorry that you're stuck in this holding pattern without any answers. I wish there were words to make it better or to take the tears away. I'll be keeping you in my thoughts. HUGS! Aww, thank you for stopping by. Time will make this better, I'm sure. The support and love from my blog readers has been wonderful. I found your blog through ICLW and am so sorry for what you are going through right now. I hope they see a heartbeat and that everything turns out all right. Thank you so much, we are praying for that too. I wonder why your OB made that statement and then decided to take it back? You have so much doubt and worry as is and don't need any of your doctors giving you hope and taking it away at same time. I hope that your next u/s gets here quickly and you finally get an answer as to what is going to happen. I'm not quite sure but I think he could see my aching for closure last week and probably said that just to give a figure of when it would be over. I honestly have no idea but I'm glad he didn't decide to stick to it because I couldn't schedule a D&C off of a beta alone. No way. So sorry you're going through this... Praying you have peace as you continue to wait. Aww, thanks Jess! Your support means the world! I'm so sorry you are having to deal with this. Being in limbo is such a terrible place to be, especially when your baby's life is on the line. I wish there was something I could do to help you get through this. You will definitely be in my thoughts. Thank you so much for the kind words and understanding.